Harley Quinn psycho-analyzes herself with a cardboard cut-out of what she used to be, before becoming a psychopath. The Flash shares a pint with the Rogues, paying his respects to their fallen. Harley accosts Billy Batson, and threatens to shoot his classmates if he doesn't speak with her. Billy acquiesces and transforms into Shazam. 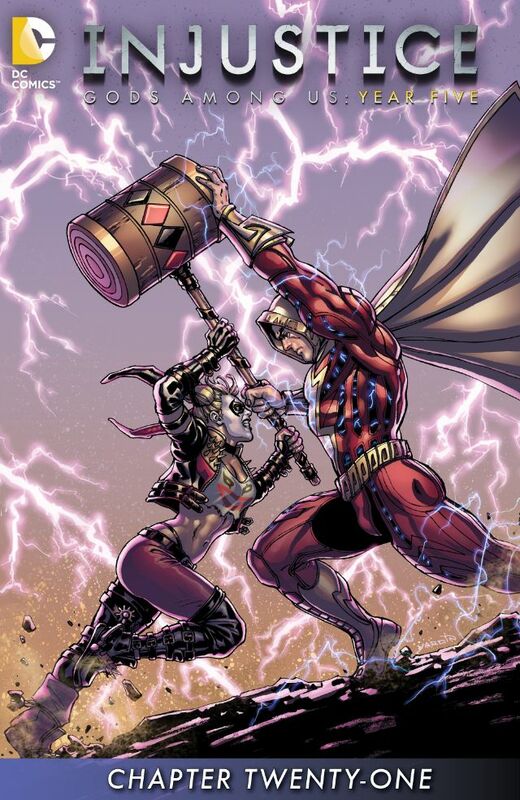 Harley wants to fight, but Shazam refuses as he doesn't want harm her. However, Harley has a bottle of green pills, and with a swing of her hammer, the fights on. Story - 2: None of this issue makes a lot of sense, but neither does Injustice, for the most part. Harley's analysis of herself is merely an excuse to use her, due to her popularity, and fill as many panels with Quinn as possible. The Flash visiting the Rogues to pay his respects could be a strong moment, only readers aren't given any backstory as to the relationship Flash has with the Rogues in this universe, so that leaves those interested to assume it's equivalent to what has occurred in the DC Universe proper, where the Flash definitely wouldn't respect anything the Rogues had done, including attempting to kill him. The fight between Harley and Shazam won't go anywhere, green pill or not, as it's already set in video game stone what's going to occur. Don't believe me? Check issue #22 and come back here for a brief history on Captain Marvel, the hero erroneously labelled as Shazam, and for all the wrong reasons. Art - 4: The Harley Quinn panels, where she shrinks herself, are very good. The use of shadow is superb, and only if there was a story to match.